Financial Institutions | Trans World Compliance, Inc. The Foreign Account Tax Compliance Act (FATCA) deadlines are approaching fast. Simply export your data from your Customer Relationship Software (CRM) or other Master Data Management (MDM) software into any format (Excel, Text, XML, or JSON) or via a direct system-to-system web services connection, and then load it and reload as often as you like into TWC's CRS/FATCA One system. All that is required is an individual or entity name and a unique identifier (it can be user assigned but is often a customer ID or account ID), but the more information the better. During the load process data is processed and flags raised on data to be examined and resolved. Red flags are raised for major deficiencies, yellow flags for minor deficiencies, and green flags if all the data is available to determine if the record either needs to be reported or we have all the data necessary and the record doesn't need to be reported. For cases of indicia the system will capture the documentation including proof of citizenship and self-certification. For entities, the US government's Global Intermediary Identification Number (GIIN) are matched, entities statuses are updated as compliant due to registration or by virtue of being covered by an IGA agreement, and the entire entity status process is supported. Obviously, reporting to the US requires different rules from UK - for example, different de minims values for reporting along with different indicia - and therefore require individual Rule Bases. As data is loaded or modified, CRS/FATCA OneTM applies the Rule Base to raise Red Flags for issues that may change the reporting relationship and Yellow Flags for issues that require review. For example, when applying a US reporting Rule Base for a specific jurisdiction a Red Flag may be raised for someone claiming foreign citizenship, but have a US place of birth. Alternatively, a Yellow Flag might be raise for a missing Tax ID number. 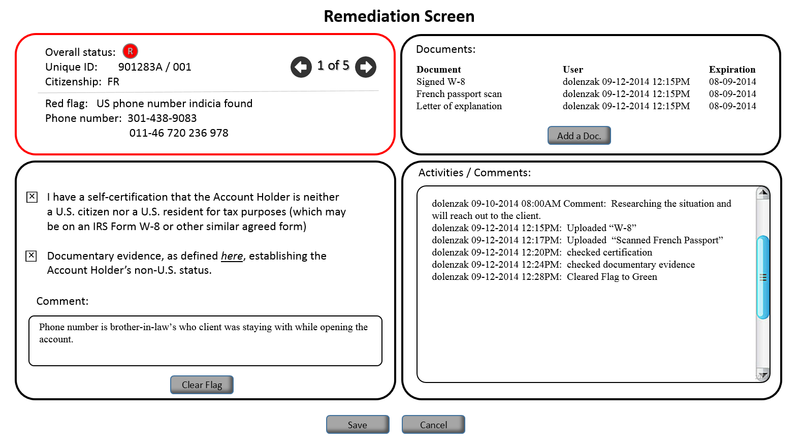 Depending on the outcome of the research on the Red Flag, the client may need to be reported, however, the missing data triggering the Yellow Flag won't change the reportability of the client record in question. When a compliance analyst researches and issue, they must sign-off on the collection of curative documentation, optionally upload related scanned documentation, and record an explanation before clearing a flag excusing that record from being reported. This data collection tracks which records should be reported or not reported, allows for an audit trail for auditors or regulators, and promotes accountability within the organization. First, Trans World Compliance has created bridges between CRS/FATCA One™ and the different tax reporting agencies, including support for US FATCA and Common Reporting Standard (CRS) standards and the reporting and exchange of information to local tax authorities or direct reporting to foreign tax authorities. Secondly, CRS/FATCA One™ provide a complete audit trail reports like the one shown to the right (click on this for a full screen example). This audit report can be run for a single record or a series of records and includes all flags, statuses, updates, documents, comments, and actions taken including by whom and when. This report is designed to show the complete record of the account including decisions made for auditors, regulators, and includes signature lines for Relationship Manager sign-off or a manager's review. Finally, CRS/FATCA One™ provide a series of management and supporting reports. These include productivity, summary reports of record status, and expiring documents (such as W-8's or equivalents, passports, and others). In the near future CRS/FATCA One™ will support witholding reports, 1042, 1099, and all other required FATCA supporting documentation. CRS/FATCA One™'s robust reporting facilitates reporting to multiple jurisdictions including identifying those records to be submitted, transforming those records into the proper format (the IRS or CRS XML formats, for example) including any local IGA requirements such as inclusion of a local company registration number in addition to a GIIN, and the encryption and submission of these records. In addition, records can be marked to be resent, voided, or corrected and resent as needed. Furthermore, CRS/FATCA One™ fully supports the FATCA process with audit trail and management supporting reporting. Providing a solid base for the constantly changing tax reporting regulatory environment. Contact Trans World Compliance today to schedule a time to see a demo and learn more about CRS/FATCA One.